TAP has the perfect home for your Suggies!!! 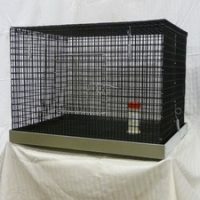 Notice: Recently there has been a lot of information on the internet concerning cages. 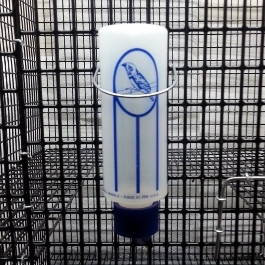 As we have always said, it is very important for gliders to live in a cage made of 1″x1/2″ PVC coated wire. If a Sugar Glider is in a Galvanized cage or most painted cages, they can have a very short life (often as little as 2 years) because they can get zinc poisoning or lead poisoning. 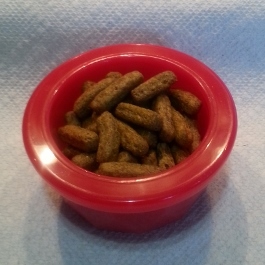 This doesn’t happen by chewing on the cage, because they normally don’t chew (not being rodents, their teeth don’t continually grow, so they do not need to chew to wear their teeth down). However, they get the poisoning because they eat some acidic fruits and veggies, and then crawl along the cage. This acid on their feet etches the cage and then later when they groom themselves, they lick the zinc or lead off of their feet and injest it. At some point, the toxins reach a critical level and kills the glider. Lately, there have been reports of PVC cages killing the gliders. The problem is that the cages that are killing the gliders are made of Chinese PVC wire. It is far more toxic than even raw galvanized wire. We have known of that wire for 15 years and have always avoided it like the plague. We have been warning about it for years. 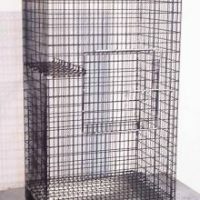 It is very important that the cage be made of USA PVC coated wire. It is made in only one place in the United States and we have been using it exclusively for over 20 years. 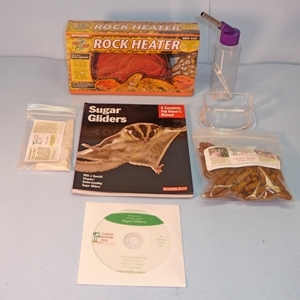 It is actually the USDA approved wire for Sugar Gliders. 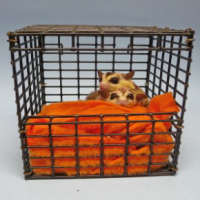 Recently another breeder and seller of gliders started providing cages made of the Chinese wire and many, many gliders started losing muscle control and died around 6 months old. For the record: None of Tropical Attitude Pets gliders were involved in this catastrophe. We will never compromise on the quality of our products to make more money. If we have to make more money we will go up on our prices, not lower our product safety. All of our cages are made in our facility in Texas with great concern given to the details. Of course we use only the proper PVC coated wire. We also include large doors on all cages large enough to accommodate them in order to be able to use our “Wodent Wheel” to provide exercise and nail trimming to the gliders. Very strong and safe latches are standard on every door. Sugar Gliders do not escape from our cages like they can in the cheap fold together Chinese cages. 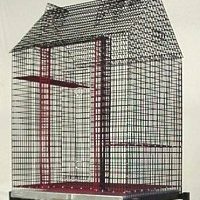 If ours gets knocked off of a table the gliders will have a rough ride, but nothing harmful will happen such as the door coming open or the cage falling apart like in cheaper cages. 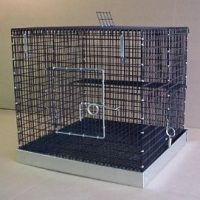 Our cages are completely assembled, but to save on shipping, some of the simpler ones can be bought in a knock down version. They come with the proper c-clips, and a c-clip tool for you to do the final assembly. 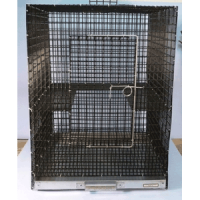 All of our dropping pans are made of heavy galvanized steel and except for the folding cages, they pull out of the front of the cage for easy cleaning. In the pans you can use paper, pine shavings, kitty litter, or any other substrate except cedar shavings. Sugar Gliders are allergic to the fumes of cedar. On the cages that are 18″ deep (front to back) we recommend using Reynolds Freezer Paper. It comes in a roll 18″ wide and fits perfectly. Put the plastic side of the paper down and you should only have to change it about once a week with one or two gliders. With this paper the cleaning is very easy, just lift the four corners and pitch it in the trash. Clean any crumbs left in the pan, and add new paper. All of the dimensions of the cages are stated in the width first (side to side), the depth second (front to back), and height last bottom to top). 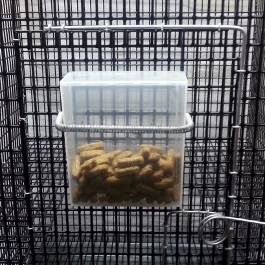 Some cages may vary by 1/2″ in order to accommodate shipping box constraints. 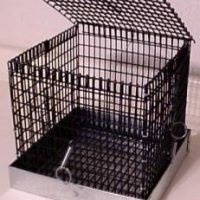 Some of the cages have the shipping costs listed along with the cage, but some do not and suggest that you call Steve for the shipping cost. In those cases the shipping costs can vary widely based upon where it is being shipped and by what means it must be shipped. Normally these cages will be the larger cages listed on this site. 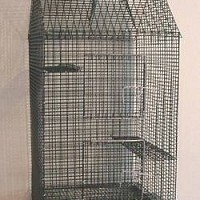 Please be aware that we can also custom build a cage to your specifications. We will advise you if there is a design flaw in your plans. We have been building cages for all kinds of animals for about 25 years and can be very useful in perfecting your designs.